Ayurveda teaches that all health-related measures—whether an exercise program, dietary plan or herbal supplement—must be based on an understanding of an individual’s unique mind-body type, known as a dosha. Your dosha reflects your innate tendencies, including your temperament, metabolism, energy level, learning style, and many other aspects of your body, mind, and emotions. To figure out your dosha, you can take the Chopra Center’s Dosha Quiz. Once you know your dosha, you can nurture balance in your mind and body by making choices that balance your dosha type. Here is a brief summary of the three primary dosha types: Vata, Pitta, and Kapha. If excessive stress in your life leads to your Vata force becoming imbalanced, your activity will start to feel out of control. Your mind may race, contributing to anxiety and insomnia. You may start skipping meals, resulting in unintended weight loss, and your digestion may become irregular. If you notice these early symptoms of a Vata imbalance, slow down, take time to meditate, don’t skip meals, and get to bed earlier. A regular lifestyle routine helps ground Vata. 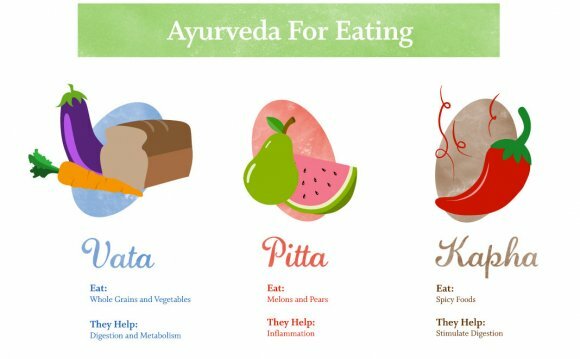 If your primary dosha is Pitta, you will enjoy a strong appetite and ability to digest food, information, and experiences. When Pitta becomes imbalanced, however, heat begins to rise in the body and mind. Heartburn, ulcers, hypertension, and inflammatory conditions reflect excessive accumulation of Pitta. Mentally, too much Pitta manifests as irritability and anger. These symptoms are signals to “chill.” Stop packing in too many things in too little time. Reduce your competitive activities, decrease your consumption of alcohol, and go for a walk in nature, enjoying cooling elements such as ocean waves or the fresh scent of trees and flowers. People with a predominance of Kapha in their nature are solid, reliable, contented souls. But when Kapha builds to excess, weight gain, fluid retention, and allergies manifest in the body. Excess Kapha in the mind manifests as resistance to change and stubbornness. People with an excess of Kapha tend to hold on to things, jobs, and relationships long after they are no longer nourishing or necessary. To lighten the heaviness of Kapha, get yourself moving and start exercising today. Give away things you have been accumulating that you know you’ll never use. The principles of Ayurveda are timeless. As you look at yourself and the world through this window, unconscious patterns will enter into your awareness. As you become conscious of your basic tendencies, you can make better choices to support harmony in body and mind. Soothing effect on the body. Brings about satisfaction and also builds body mass.